1.Which broadband wireless technology is based on the 802.11 standard? 17. The graphic shows two routers, R1 and R2, that connect to the Internet. There is a site attached to each router. Site A is attached to router R1 and site B is attached to router R2. A tunnel is shown spanning the Internet between the two routers. Refer to the exhibit. What solution can provide a VPN between site A and site B to support encapsulation of any Layer 3 protocol between the internal networks at each site? 19. Refer to the exhibit. Which IP address is configured on the physical interface of the CORP router? 20. Refer to the exhibit. 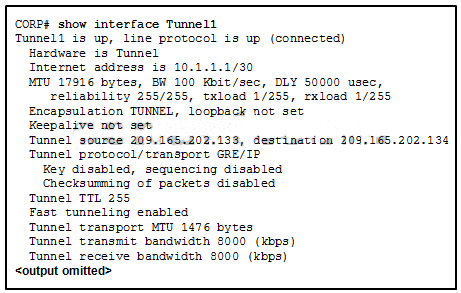 Which IP address would be configured on the tunnel interface of the destination router? 27. At which layer of the OSI model does multiplexing take place? 28. Which command can be used to view the cable type that is attached to a serial interface? 29. Which field marks the beginning and end of an HDLC frame? 30. 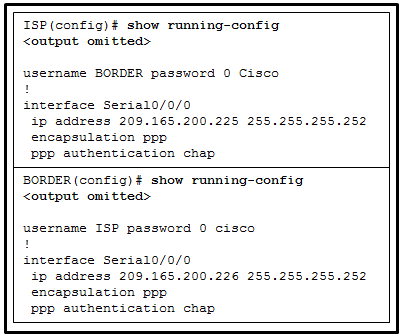 Which serial 0/0/0 interface state will be shown if no serial cable is attached to the router, but everything else has been correctly configured and turned on? 31. Which is an advantage of using PPP on a serial link instead of HDLC? 33. 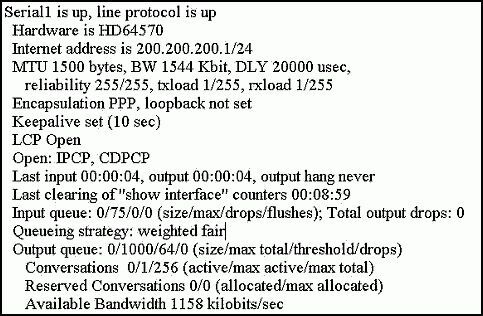 How does PPP interface with different network layer protocols? 34. Which address is used in the Address field of a PPP frame? 37. Which protocol will terminate the PPP link after the exchange of data is complete? 40. Which PPP option can detect links that are in a looped-back condition? 41. When configuring Multilink PPP, where is the IP address for the multilink bundle configured? 42. Refer to the exhibit. Which statement describes the status of the PPP connection? Only the link-establishment phase completed successfully. Only the network-layer phase completed successfully. Neither the link-establishment phase nor the network-layer phase completed successfully. 43. Refer to the exhibit. A network administrator is configuring the PPP link between the two routers. However, the PPP link cannot be established. Based on the partial output of the show running-config command, what is the cause of the problem? 44. In which situation would the use of PAP be preferable to the use of CHAP? 46. Refer to the exhibit. Based on the debug command output that is shown, which statement is true of the operation of PPP. Compression -> Increases the effective throughput on PPP connections by reducing the amount of data in the frame that must travel across the link. Multilink -> Provides load balancing over the router interfaces. 50. Open the PT Activity. Perform the tasks in the activity instructions and then answer the question. 51. 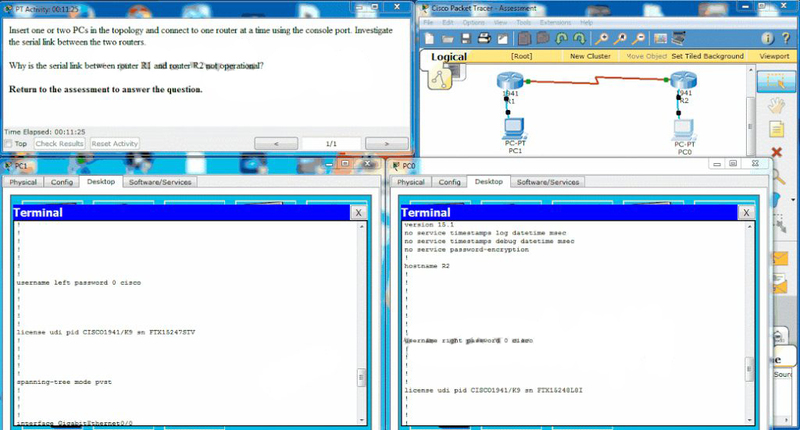 What PPP information will be displayed if a network engineer issues the show ppp multilink command on Cisco router? 53. A network engineer is monitoring an essential, but poor quality, PPP WAN link that periodically shuts down. An examination of the interface configurations shows that the ppp quality 90 command has been issued. What action could the engineer take to reduce the frequency with which the link shuts down? 54. A network engineer is troubleshooting the loss of MPEG video viewing quality as MPEG video files cross a PPP WAN link. What could be causing this loss of quality?